The whole Tokaido group in front of the house. Today we went to Minka- En to look at old Japanese houses to get an idea of how they were built. We were all assigned different houses to concentrate on. 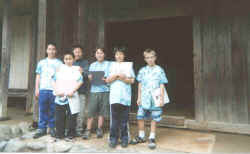 I was assigned, along with the whole Shikoku clan, to the village's head fishermen's house. My job was to describe the inside and count the rooms. It was a great job because I got to check out every thing inside. A lot of things were built into the materials- such as a shelf to put their tools in and a little thing that is dug into a unmovable wall that holds a little Buddha figure, which made-up the house. I also noticed that the poles, that were supporting the house that were sticking up from inside the house, were sturdy and mostly in the doorways. The eight rooms were mostly elegant. Man, this guy's rich! It was nice and elegant inside, too. When I was back at school, I realized that that trip was educational yet fun! The Sakura house of a very wealthy head fisherman was designed in the late 17th century. 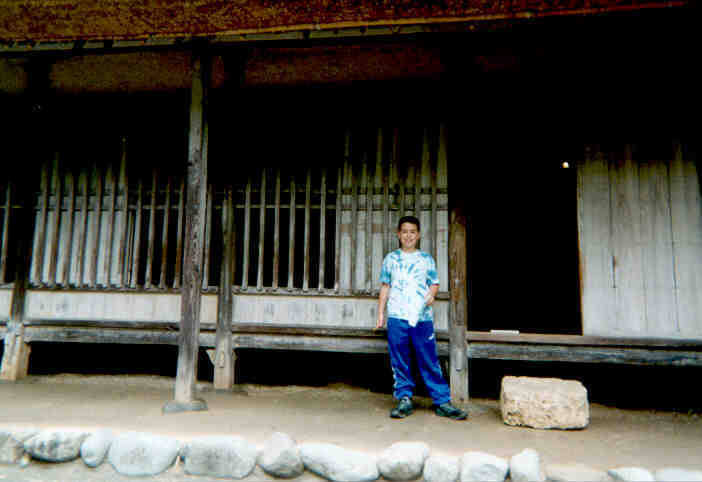 The outside of the house is made of straight planks of wood and there are pillars for decoration. The windows are pieces of wood with plaques in a pattern. On the roof there is bamboo in a cross-hatch pattern covered by many layers of straw so thick that nothing can get through. On the very top of the straw, there were ceramic tiles with planks of bamboo on the edge. The materials used on the house include wood for the outside and rocks around the perimeter to keep water from rotting the wood. The bamboo was used to keep the straw from caving in. Paper covered by clay was used on the walls to keep the warm air in and the cold air out. Going to Minka En was really fun. 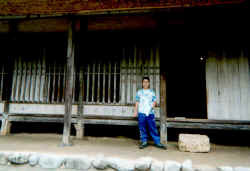 I enjoyed walking around and seeing the rich peoples’ houses and the poor peoples’ houses. In the Sakuta house, home of the chief fisherman, most of the furniture is built in and has at least two purposes, liike the tatami mats were a Japanese bed and couch/chair. There is very little ornamentation, the natural curves in the wood beams holding the ceiling together was basically all the decoration in the house. Since the house was owned by the chief fisherman, the tools we found inside were mostly for fishing. 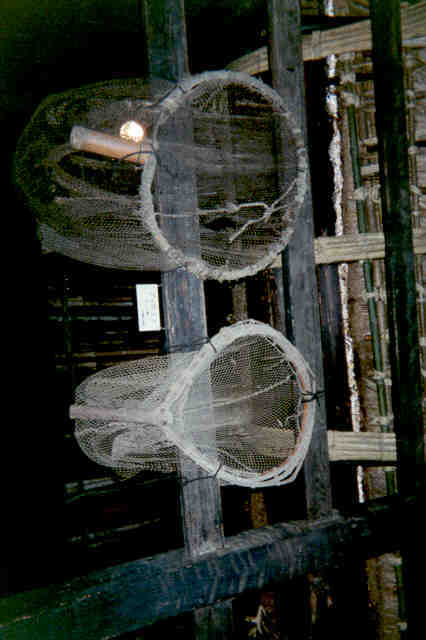 There was a tsuna (a rope), boat paddles, ami (fishing net), and Bukarami (hand held net).Other functional items were mostly related to cooking. 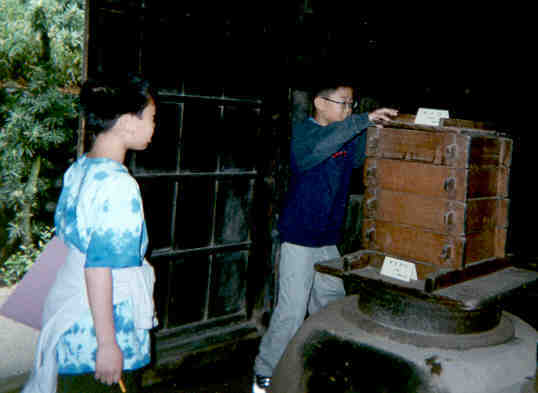 Those tools were the karausu (big bowl for pounding mochi), kine (hammer for pounding mochi), toumi (rice cleaner), and the kama (rice cooker). This house was built in Chiba in the late 17 century. That means the house is a little more then 300 years old. The salt smell of the sea lingered in the air as the fishermen made their way up the beach to the Sakuta house. It was early morning, but the men had been out on their boats catching tako—octopus and other fish and their boats had already been unloaded. 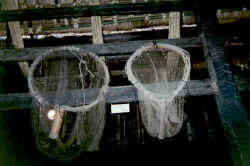 Now, they were going to the chief’s house to fix the ami- fishing nets that had gotten torn. It looked to be a sunny and hot day. It would feel good to sit under the eaves of the roof and feel the breeze as they worked and the flowers, trees and bamboo around the house would keep it cool. There would be a fire going in the kitchen area to cook the fish for the noon meal. The smoke would drift upwards, drying the thatch and keeping the roof bug free. Suddenly, they saw men coming towards the house off the Tokaido Road. They stared for they were not used to seeing such grand men. Edward at the side of the house. Keenan and Gaby check out the drawers.